GeoVax Labs, Inc. is a clinical-stage biotechnology company developing human vaccines and immunotherapies using its novel viral vector platform technology against infectious diseases and cancer. The Company’s patented Modified Vaccinia Ankara Virus-Like Particle (MVA-VLP) technology is the foundation for producing non-infectious virus-like particles (VLPs) from the cells of the individual receiving the vaccine. Producing VLPs in a vaccinated individual mimics a natural infection, stimulating both the humoral and cellular arms of the immune system to recognize, prevent, and control the target infection should it appear, while maintaining the safety characteristics of a replication-defective vector. GeoVax is focused on developing vaccines against hemorrhagic fever (HF) viruses (Ebola, Sudan, Marburg, and Lassa), Zika virus (ZIKV), malaria, and human immunodeficiency virus (HIV). The Company also has programs to develop a vaccine to treat chronic Hepatitis B virus (HBV) infection and to apply its MVA-VLP technology to cancer immunotherapy (immuno-oncology). Furthermore, GeoVax is collaborating with Emory University to develop a therapeutic vaccine for human papillomavirus (HPV) infection, with a specific focus on head and neck cancer (HNC). GeoVax believes its expertise is complementary to a range of other human diseases for which there is an unmet medical need, with plans to expand its pipeline. GeoVax announced its selection as a finalist in two award categories at this year’s 12th Vaccine Industry Excellence (ViE) Awards program, held in conjunction with the 19th World Vaccine Congress. GeoVax’s immuno-oncology product was selected as a finalist for the “Best Therapeutic Vaccine Award” and its novel MVA-VLP vaccine platform was selected as a finalist for the “Best New Vaccine Technology Award.” The ViE Awards will be announced on April 15th, 2019. In 2018, GeoVax received the “Best Biotech” ViE award and was a finalist in the “Best Prophylactic Vaccine” category for its Zika virus vaccine. GeoVax’s most advanced vaccine program is focused on preventing the clade B subtype of HIV prevalent in the larger commercial markets of the Americas, Western Europe, Japan, and Australia. This program is currently undergoing human clinical trials in the U.S. with support from NIH/NIAID. In October 2018, positive results from HVTN 114, a Phase 1 trial of GeoVax’s preventive HIV vaccine, were presented at the HIVR4P conference in Madrid. In seeking to develop a functional cure for HIV, the Company has a collaboration with American Gene Technologies International, Inc. (AGT) to use its vaccine in combination with AGT’s gene therapy, which is on track to enter a Phase 1 trial sponsored by AGT. AGT anticipates starting the trial during the second half of 2019. In 2018, GeoVax started with a single program within the field of immuno-oncology for tumor-associated MUC1 vaccines. This program continued to be supported by two collaborations (University of Pittsburgh and ViaMune). During 2018, GeoVax added four additional collaborations to expand its presence within this space: (1) Vaxeal Holding SA (Cyclin B1 tumor-associated antigen), (2) Emory University (HPV-related head and neck cancers), (3) Virometix AG (also for HPV-related cancers), and (4) Leidos, Inc. (multiple potential cancer targets). GeoVax and Enesi Pharma have recently collaborated to develop solid-dose needle-free vaccine formulations utilizing GeoVax’s MVA-VLP vaccine platform combined with Enesi’s ImplaVax® technology. The collaboration is expected to include development of thermostable solid-dose needle-free vaccines for a variety of infectious diseases and evaluation of the potential to generate improved vaccine responses with simplified administration and reduced storage and distribution costs. 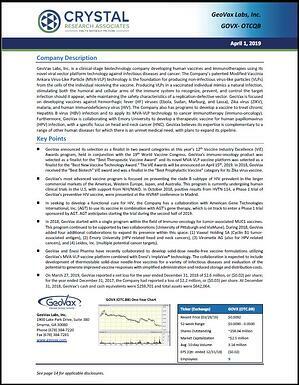 On March 27, 2019, GeoVax reported a net loss for the year ended December 31, 2018 of $2.6 million, or ($0.02) per share; for the year ended December 31, 2017, the Company had reported a loss of $2.2 million, or ($0.03) per share. At December 31, 2018, GeoVax’s cash and cash equivalents were $259,701 and total assets were $642,064.